The Manila Mint was the only facility established for production of United States coins outside of the mainland. This plant was housed in the northeastern portion of the ground of the Intendencia Building (the former old Central Bank Building) and had a daily production facility of 80, 000 coins with the following machinery and equipment: one breaking roller, one finishing roller, one cutting press, one punching machine, one annealing furnace and acid solution tanks, one lifting machine, one washing machine, one drying machine, one upsetting machine, one reviewing machine, two stamping or coining presses, and one counting tray. The compliment of said mint was composed of 50 officials and employees which was later increased to 80, when daily production requirements of about 200, 000 pieces necessitated working in three shifts shortly before the outbreak of the war. Many errors and trial strikes were reportedly produced from the Manila Mint. The inexperienced employees and the introduction of then modern machinery made it difficult for the local personnel to easily adapt with the normal production of coins. 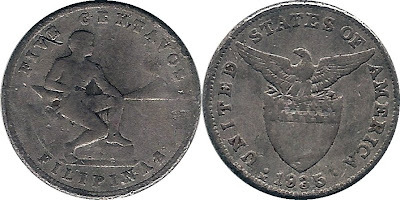 Most likely before normal production of coins began, there were several practices or trials made to familiarize the employees with operation of machines and the quality of coins qualified for the Mint’s standard. Some of these test strikes were done on sheet of metals, soft alloys and metals such as lead and pewter, and other available materials. However, most of these die trials and patterns were assumed to have been lost at the outset of the war. Some of the famous trial strikes that were documented included the 1937 twenty centavos aluminum from the private collection of King Fahrouk, a 1939 two-tailed One Centavo, and the Lead trial strike of a 1935 Five Centavos, assumed to be the last die trial for the design belonging to the series of five centavos from 1930 to 1935. Other reported Lead five centavos surfaced in the past mostly dated 1934. Due to the condition of these coins, some local numismatist labeled them as contemporary counterfeits produced in Thailand. However, such hypothesis still remains a mystery up to this date since most counterfeiters even back then were interested more in counterfeting silver crowns. I have acquired a scanned image of the 1935 Five Centavo Trial strike in Lead. The coin’s condition is excellent considering that the metal survived despite its softness and sensitivity to react with other metals. The obverse is in Almost Uncirculated condition while the reverse of the coin is in Fine condition only. However, such is enough to determine the coin’s authenticity. In terms of weight, the coin is a little bit heavier compared to the normal cupro-nickel Five centavos.